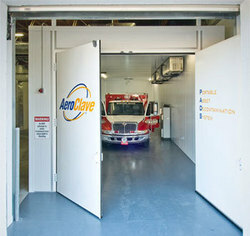 Garner Decontamination Solutions now uses new AeroClave® technology to sterilize healthcare facilities, public areas, ambulances and other vehicles and areas using an Energized Hydrogen Peroxide process to stop infections. Garner Decontamination Solutions is introducing a new service that quickly and efficiently sterilizes large areas and vehicles using Energized Hydrogen Peroxide (eHP™). The process produces a gas plasma that migrates to every surface in the sterilized area. It is safe for sensitive electronics. Portable units can be taken to any location to sterilize hospital rooms, surgical suites, clinics, schools, even entire buildings. They can sterilize areas in one to two hours, having them ready to use at the end of that time. The sterilization process is infinitely scalable for larger areas. The PADS (Portable Asset Decontamination System) unit, located near the Houston, TX Medical Center is a 60’ drive-in chamber that can sterilize vehicles inside and out in one hour. It can not only sterilize ambulances and police cars, but can sterilize large semi-trailer loads of sensitive medical equipment and goods. These services are offered on a regularly scheduled basis and are also available 24/7 for emergency response. The process results in hospital operating room sterilization levels, killing viruses, spores and bacteria such as Staph, HIV, Anthrax, C-Diff, H1N1 Flu, MRSA and Tuberculosis to name a few. Sterility on each run is proven using scientifically accepted methods. This process results in shorter hospital stay times and healthier patients and healthcare workers. Garner is a 30 year old independently owned and operated company.